Let’s face it, salads can be boring…mundane… expected. It’s the go-to dish when you want to feel good about what you’re eating. But so often, to make them palatable you need to fill them with things that perhaps, are not so good for you. Creamy dressings, crunchy fried croutons, gooey cheeses, bacon!!! Seriously, when you get done with one of those salads, you just might as well have had a sandwich. This is not one of those salads. 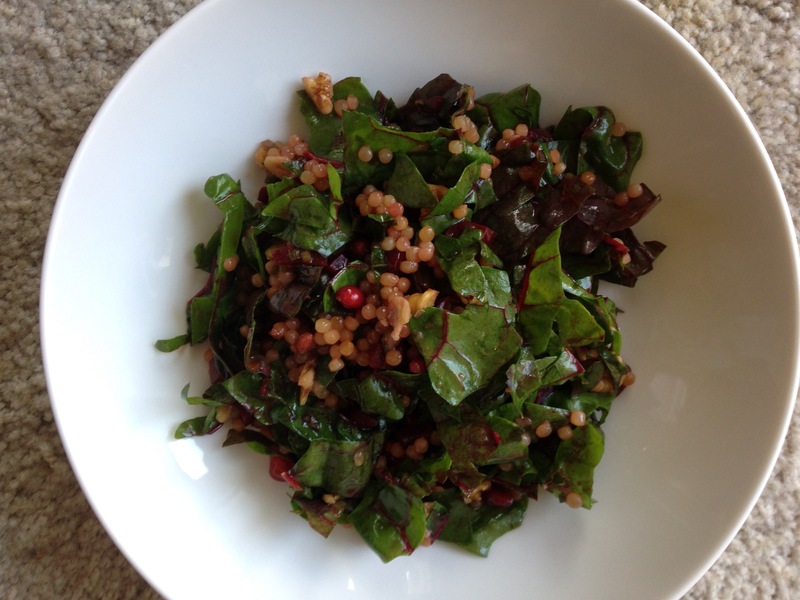 Toasted Couscous & Chard Salad is everything a salad should be. First of all, its gorgeous. Nobody wants to eat an ugly salad. In addition, it’s chock-full of nutritious ingredients, it has a multitude of textures going on, loads of unexpected flavors, and best of all – not an unhealthy ingredient in the entire bowl. It also just so happens to includes my most-recent total obsession: Pomegranate Molasses. I honestly don’t know how I’ve lived so long without this stuff. I also don’t know why I’ve gone so long without making this salad. It is a true keeper. Try it and see if you don’t agree. The recipe comes from Better Homes & Gardens Magazine and the only change I’ve made was with the beets. I did not have raw golden beets so I used cooked red beets and simply diced them. Meanwhile, in a very large nonstick skillet melt butter with Aleppo pepper, 1/2 tsp kosher salt, and 1/4 tsp black pepper over medium-high heat. Add green onions; cook 1 minute or until fragrant. Add couscous; cook 5 minutes until toasted. Slowly stir in chicken broth. Cook until all liquid is absorbed and couscous is al dente. Stir in beets; heat through. Remove skillet from heat. Add parsley, pomegranate seeds, walnuts, mint, vinegar and molasses; toss to combine. Toss with chard and drizzle with olive oil before serving. Previous Weekly Winner: Mean, Green, …Game Food?? Next Weekly Winner: Super Cozy, Super Tasty, Super Healthy -But What Is It?